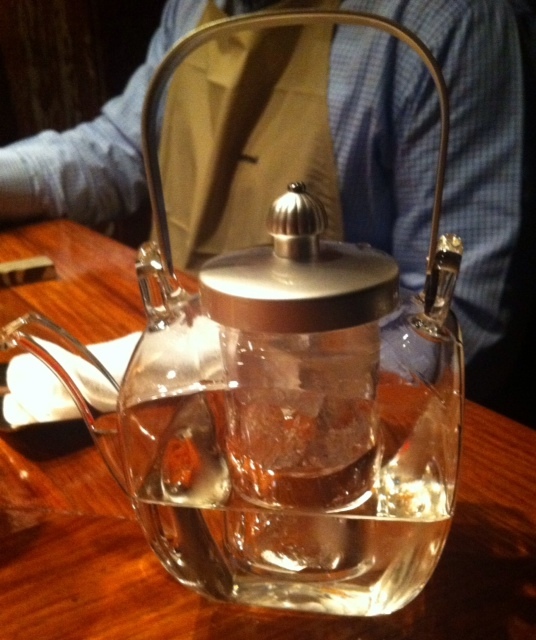 This is not tea; this is how they serve sake at a wonderful restaurant called Mon Cher Ton Ton in Roppongi. It’s a teppanyaki restaurant, so the entire meal is prepared on the grill in front of the diners. We normally order a set that includes a salad, a succulent steak and prawns that the chef puts on the grill live. It’s wild to watch the seconds of squirming before they finally succumb but I have learned to hide my eyes. After the prawns are cooked, we get to eat the body and tail while the chef re-grills the heads, seasons them and serves them separately. Delicious! A month ago my cousins were visiting from New York and they loved the meal from the salad start to the garlic-rice finish. But Susan did look at me and say, “Oh my goodness, I just ate a shrimp head!” The rest of us had a good giggle over it. Mon Cher Ton Ton is one of those special places in Tokyo where every detail is taken into account, right down to keeping the sake cold. If you look carefully, you can see the middle of the “pot” is full of ice. Japanese people take the alcohol seriously and great service is a hallmark of the culture. Put together, the service of alcohol is always carefully considered and beautiful. At the restaurant, every few minutes a server added a tiny bit of sake to our tiny, little cups so we lost track of precisely how much we were drinking, a common problem in the Tokyo restaurant scene. But if we have to get a little tipsy over dinner, certainly it’s fun to do it with such a lovely vessel for the alcohol. ← You Can Get WHAT in a Vending Machine in Japan?? Sake, served right. That’s something that I’d love to try. Have to find a nice place to experience it somewhere in a hundred mile radius of my little Texas town. I would not patronize a restaurant that grilled live animals – even if they are crustaceans. I don’t care how lovely their sake pot is. I really appreciate your comment! Cooking food while live (i.e. “fresh”) is a huge part of Japanese food culture. It’s ubiquitous. It is not my favorite part of the culture, but there are so many other, wonderful things that I overlook it.